Since 1971, KMT Waterjet has been instrumental in pioneering waterjet technology. With its PRO high-pressure range, KMT Waterjet Systems sets new standards in the field of waterjet cutting. 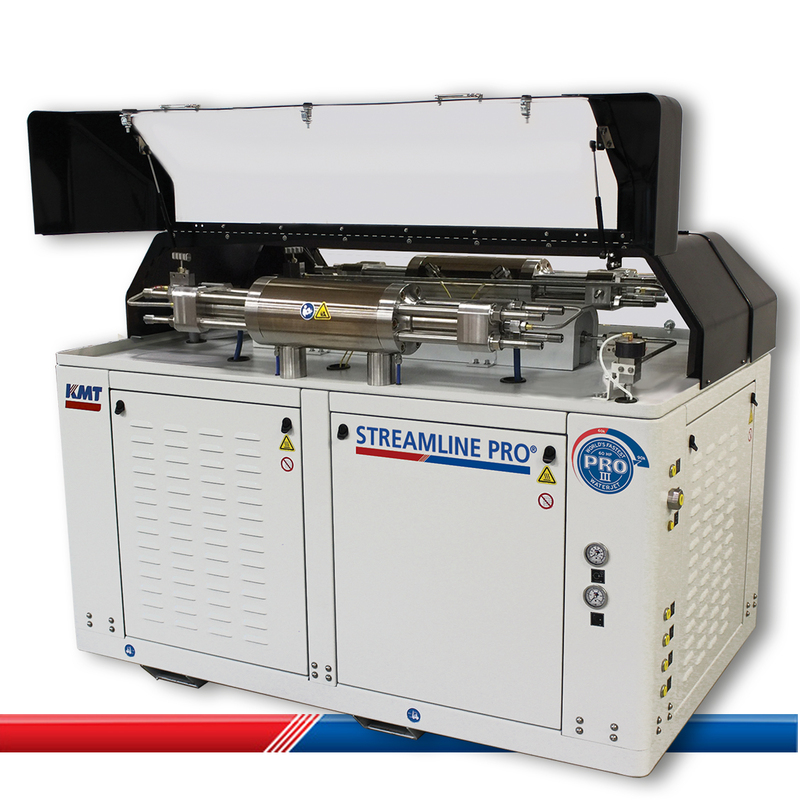 PRO stands for waterjet cutting technology with operating pressures of up to 6,200 bar, and the new range of products of course includes all necessary components and accessories - from high-pressure generation units to orifices that guide the cutting jet with great precision onto the material. 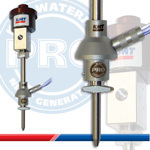 Taking into account the increased exposure to high pressure, the PRO products were designed to ensure economical operation with enhanced service life. 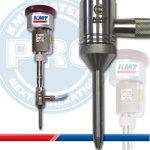 The original PRO series by KMT Waterjet thus offers you optimized high-pressure equipment meeting the highest requirements as regards reliability and cutting quality in heavy-duty continuous operation. The STREAMLINE PRO is available in two models with 45 kW and 93 kW. At a pressure of 6,200 bar, the machines offer volumetric flows of 2.8 l/min and 5.8 l/min respectively. This enables operator to cut with single or multiple heads. Pure water cutting applications are among the most demanding of subcontracting jobs in the industry. Pure water cutting applications usually work with significantly higher cutting speeds compared to those of abrasive cutting. The wide range of cutting tasks and numerous switching cycles puts a heavy strain on the nozzle valve. 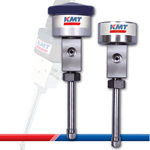 With the AQUALINE PRO pure water cutting head, KMT has developed the perfect solution for 6,200 bar applications. As the cutting speed is higher than with 4,000 bar, delamination is significantly reduced and in many cases completely eliminated. Depending on the actual requirements, the valves are available as normally open (N/O) or usually closed (N/C) valves. These high-pressure valves usually open in less than 50 ms, depending on the operating pressure. High precision, sturdy design and extremely short switching times are the key features of the AQUALINE PRO waterjet cutting head range. The PRO abrasive cutting heads from KMT Waterjet Systems have been specially designed for waterjet cutting with 6,200 bar. Their design and materials can withstand huge forces while focusing the energy to the point where it is needed, namely to the cutting jet. Among the outstanding features of ACTIVE AUTOLINE PRO cutting heads are automatic precision positioning, perfect repetition accuracy, high cutting speeds, long service life and easy maintenance. 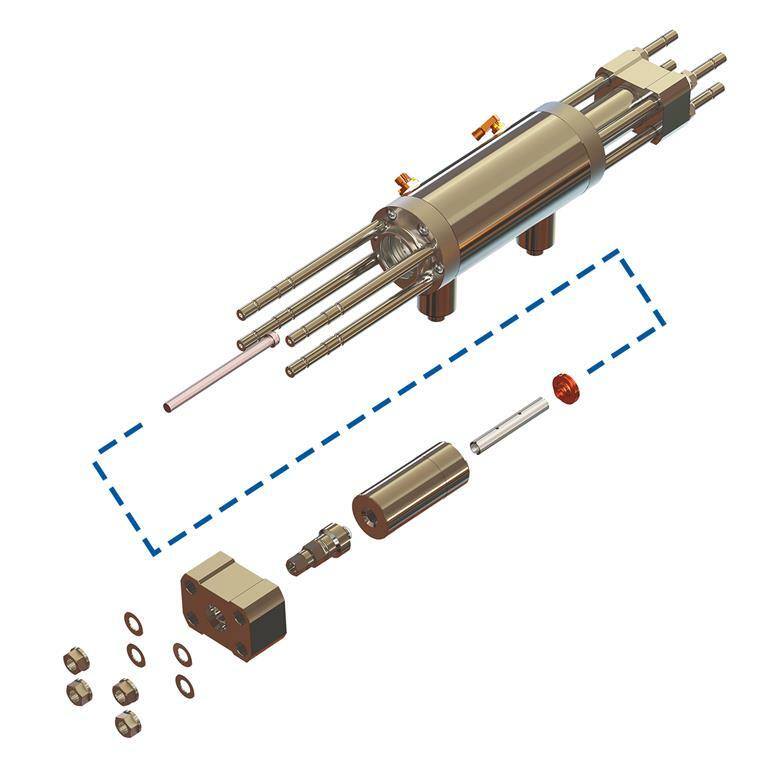 It takes only seconds to replace the few wear parts of the cutting head, such as the orifice, mixing chamber and focusing tube, and no tools are required. In order to keep routine maintenance to a minimum, these parts are made from tough wear-proof materials. The typical features of KMT Waterjet products based on the innovative approach for efficiency and economy in continuous operation have thus been successfully integrated into the design of the cutting head. ACTIVE AUTOLINE PRO cutting heads can be integrated into all waterjet cutting systems with rigid or multiple head connections. The ACTIVE IDE PRO cutting head features a diamond orifice which is firmly integrated into the orifice body. A specially devised manufacturing method ensures that the waterjet is properly aligned at all times and connected to the mixing chamber located below the orifice body. In the mixing chamber, the abrasive is added to the waterjet. The stringent production tolerances for the mounted cutting head guarantee that the cutting jet is always properly aligned along the axis. As the waterjet exits the focusing tube at the correct angle, the power of the waterjet is focused for optimum impact. This allows for maximum cutting speeds at minimum cutting gaps combined with excellent cutting edge quality.